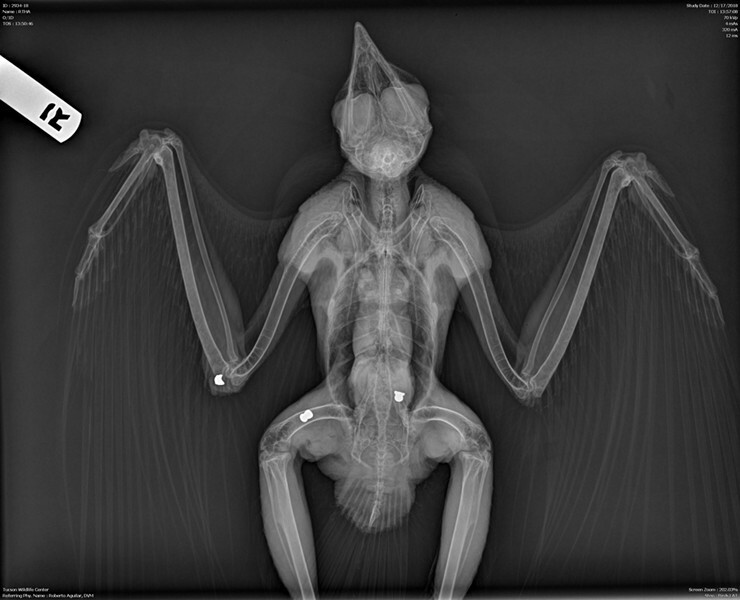 A radiograph shows a red-tailed hawk shot in three places. After seven cases involving the illegal shooting of wildlife last month, the Arizona Game and Fish Department is asking the public to be more aware of such incidents and report any suspicious activity. The incidents, two in Sierra Vista and the rest in the greater Tucson area, involved wildlife being either dead on arrival for treatment, or euthanized. The animals included two Cooper’s hawks, two javelina, a great horned owl, a red-tailed hawk and a raven. According AZGFD, the maximum penalty for a felony violation of the federal Migratory Bird Treaty Act is a $250,000 fine and two years in prison. To report suspicious activity or suspected violations to Operation Game Thief, call 800-352-0700.